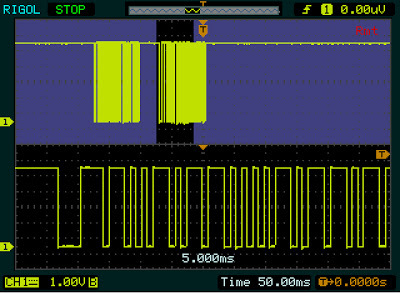 In this article I share a few tips I've learned about using the Rigol DS1052E oscilloscope. The Rigol DS1052E digital oscilloscope. The knobs all have convenient actions if you push them: pushing Vertical Position or Horizontal Position centers the trace vertically or horizontally. Pushing Tigger Level sets it to zero. Pushing Scale sets it to fine adjust mode. If you don't use Long Memory, you're wasting most of the capacity of the oscilloscope. Long Memory stores 64 times as much data, so you can really zoom in on the waveform. To enable Long Memory, push the Acquire menu button, then select MemDepth to set Long Mem. There's additional documentation here. 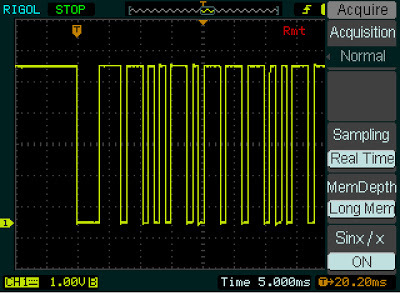 The Long Memory depth option of the Rigol DS1052E oscilloscope. Once you've recorded a waveform, you can pan across it using the horizontal position knob - the waveform window indicator at the very top of the screen shows where you are. In mid-range settings, however, the pan range is fairly limited (about a factor of 5) compared to how deep you can zoom with the horizontal scale knob (about a factor of 1000 with Long Memory). Note: zoom works best with Single triggering; if you use Auto or Norm triggering and hit Run/Stop, sometimes the detailed data isn't in memory and zoom doesn't show more than is on the display. Pushing the horizontal scale knob turns on the cool zoom mode, which lets you see the trace and a zoomed-in version at the same time, letting you zoom and pan. 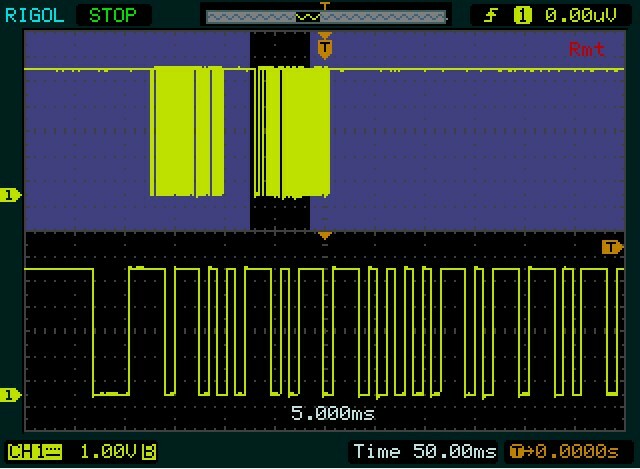 The zoom feature of the Rigol DS1052E oscilloscope. Most of the menu buttons are in the group of 6 at the top. However, there's also a trigger menu button under the trigger knob and a time base menu under the horizontal position knob. This is in addition to the four vertical menu buttons: CH1, CH2, MATH, and REF. Among other things, the time base menu lets you select X-Y mode. The menus hide about 1/6 of the display, so close the menu when you're done: push the round Menu On/Off button or push a menu button a second time. The Auto button is right next to the Run/Stop button, so you might think it will set the trigger to Auto Sweep. Instead this button sets the controls to seemingly-random values to aotomatically display your traces. This is good if you're totally lost, but more likely to wipe out the settings you want. 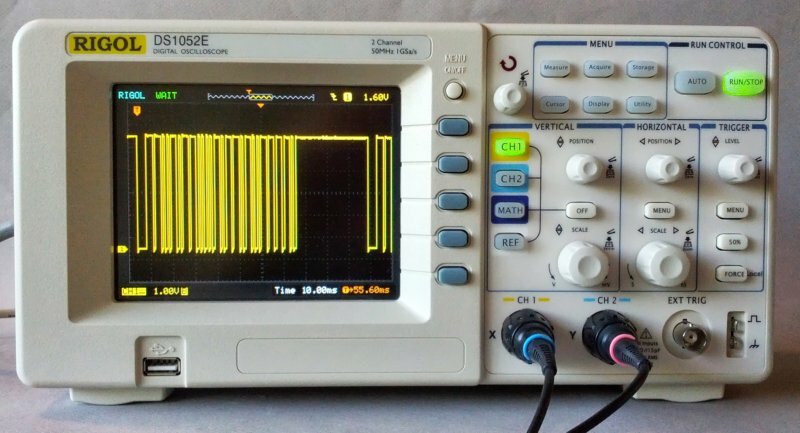 An alternative is to run the slightly clunky UltraScope software on your computer, which gives you access to the oscilloscope via USB. You can download "UltraScope for DS1000E" from the Rigol Software Applications page; although it has a PDF icon, it's actually a Zip file with the software. The built-in help feature of the Rigol DS1052E oscilloscope is triggered by holding down a button or knob. The three trigger sweep modes are Auto, Normal, and Single. Auto will keep displaying traces until you hit Run/Stop. Normal will display a trace every time the trigger condition is satisfied. 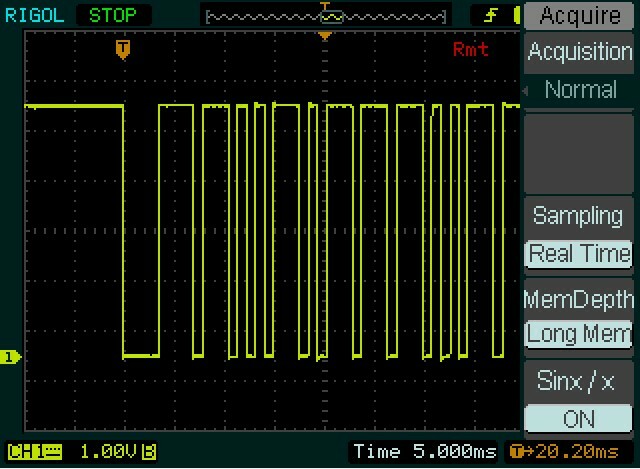 Single will display a single trace when triggered and then stop. Auto is the way to see a waveform without worrying about triggering. But if you want a nice, stable waveform, set up the trigger and use Normal. 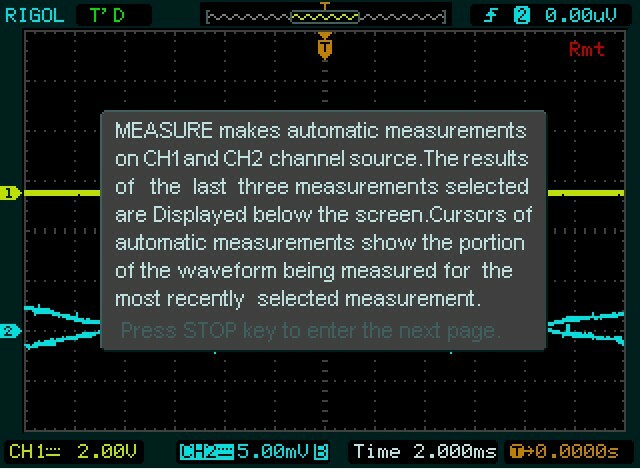 Also make sure you're triggering from the right channel - the oscilloscope likes to default to using Channel 2 as the trigger. 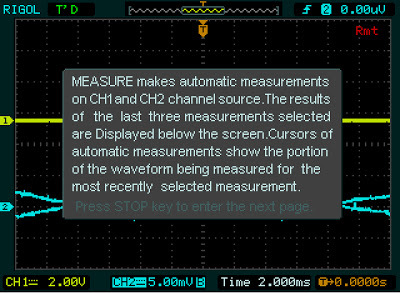 If you've used an oscilloscope with separate controls for each channel, you may expect the knobs near CH1 to control channel 1, and the knobs near CH2 to control channel 2. Instead, if you hit CH1, the knobs control channel 1's scale and position, while if you hit CH2, Math, or Ref, the same knobs control that channel's scale and position. Make sure you're controlling the trace you think you're controlling. Maybe this is too obvious to mention, but putting matching colored rings on both ends of the oscilloscope probes lets you easily tell which probe goes with which channel. Label oscilloscope probes with colored rings that match the trace colors. 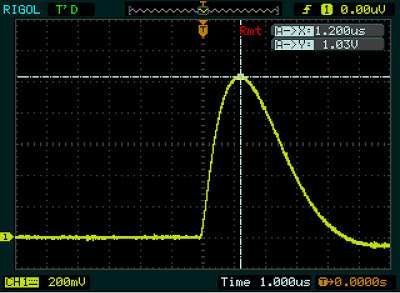 The cursors are very handy to measure voltages, times between two points, frequency, etc. (The Measure mode provides lots of automated measurements, but often doesn't measure what you want.) Manual mode lets you position two cursors (either vertical or horizontal), and the positions and difference are displayed. Track lets you position a cursor along the waveform, and a voltage cursor automatically tracks the waveform. Both time and voltage values are displayed. Auto mode is the mode you should use with Measure, in order to see what the measurements mean. A tracking cursor puts X-Y lines on the waveform and gives measurements. Search for DS1000E (not DS1052E) to find the user's guide and other documentation. I'm glad I bought the Rigol DS1052E - it performs very well for a low-price ($329) oscilloscope. (If money is no object, there's Agilent's $439,000 Infiniium oscilloscope. :-) I hope you find these tips useful. If you have any additional oscilloscope tips, please leave a comment. I got one too! I bought it via Taobao in China for about $250 - and it's a wonderful workhorse! I will bookmark your page! Thanks for the tips. This is my first 'scope. Yeah, I'm a beginner. This is easily the best and cheapest way to learn this art! Anonymous: if you pick Manual cursor, both cursors are the same: X or Y. If you pick Track, then you select the X cursor position, and the scope sets the Y cursor position based on the waveform. So you have 2 X and 2 Y cursors, but the X and Y have to intersect on the waveform. Well, this page could be a gem of a find! Just bought at DS1052E and I don't really have much of a clue, so I guess I'll be revisiting this page quite often. My apologies for going off topic, but I need a Function Generator to complement this 'scope. Any ideas? I picked up a used one of these DS1052E for $150 from someone upgrading to a 100MHz scope. For the price I love it. Thanks for the excellent post. I recently bought a used DS1052D for the equivalent of approximately $215. It is fairly new and was owned by a student. It did not come with the Logic Analyser cable. Can I make up this cable or is it better to buy one? Any suggestions/advice?? a firmware hack can make this be a 100 MHz scope! You can also hit the dedicated "print" button to dump a PNG screenshot to the UBS Drive. A little faster than going though the storage menus. There is also this handy driver-less screenshot software that works over the Ethernet connection. To set the user interface language, press "utility" then the the fourth soft button, then rotate the menu knob, then press it. or do what I did: mash buttons at random until something recognisable comes on screen..
josh: You mention a dedicated "print" button - what button are you describing. There's no print button on the DS1052E. can i record waveform and analyze it in some logic analyzer software on computer?